Ahem.. pardon for our excitement. Situated at the another ever so happening Solaris Mont Kiara (well, almost every parts of KL are ever so happening. In a different way of course. 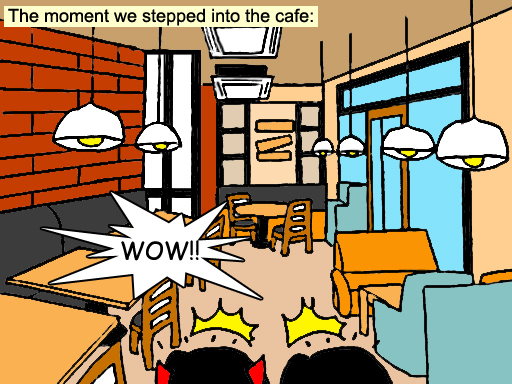 ), Pretz N' Cafe attracts many passerby's attraction with its bright orange lights surrounding its cafe. From what you can see from these picture, the Cafe is too hard not to be noticed, especially at night. It blooms as if this is the shiniest place to be in Solaris Mont Kiara! 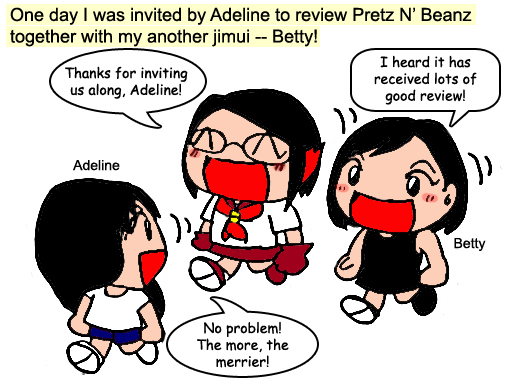 I was told that Pretz N' Beanz are famous for its Pretzel. Sounds like another Aunty Anne wannabe, however, it was much more softer and chewier than what I've got from Aunty Anne. I was in awe with it's lighting and interior setup in the Cafe, which overall gives us the orange-brown kind of feeling, aka the Pretzel's colours I might add. 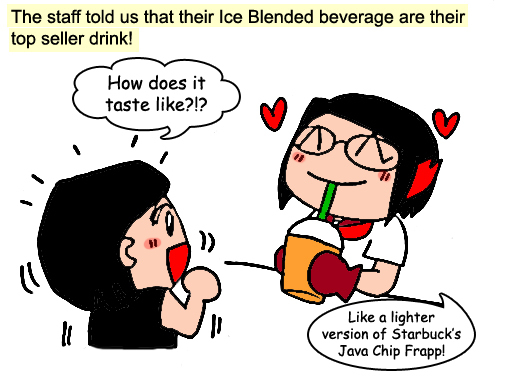 BEVERAGES - Ice blended, maybe? I personally think it tastes more chocolate over coffee, which is good for me at that time. Nevertheless, it's a kind of drink which makes you feel like a kids who enjoy eating chocolates. I hereby approved their "Ice Blended is our best seller" sentence! Love the art and its texture. However, the taste is rather mild. Maybe I prefer stronger taste? Same goes to Green Tea Latte. It was rather mild. FOOD - What you should try? I guess they made the Pretzel thick is for me to hold. The cheese layer maybe thick yet it was very cheesy I enjoy tearing it apart. Thick pretzel, thick cheese, how about with BBQ chicken? Still as awesome as Chicken Hawaiian! It all comes down to which is your preference. This is not another kind of fish n chip you find it out there, whose fries are soggy and fish were hard. I love how they made the salad part which balance up the flavour from fish and chips (if you eat it together). BIG love to this cabonara! The sauce maybe oversupplied but the noodles & its ingredients were perfectly cooked! I still enjoy it I'd rather to have it all by myself LOL. Calling for cinnamon lovers!! This is for you! The cinnamon sugar were spread evenly you won't feel it was too sugary. 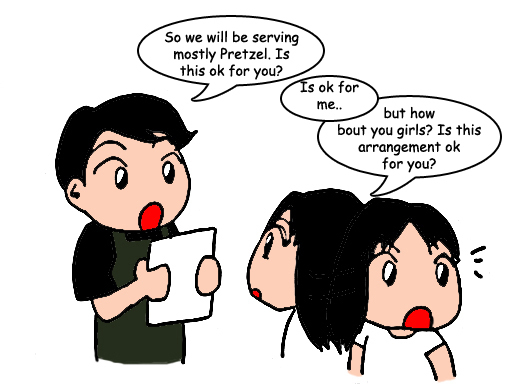 Not to mention the pretzel is warm and soft the minute it has been served on our table, due to its made-in-order. I reckon this is a perfect afternoon-tea food for you. The cheese were spread evenly on top of the pretzel before it sent to the oven. 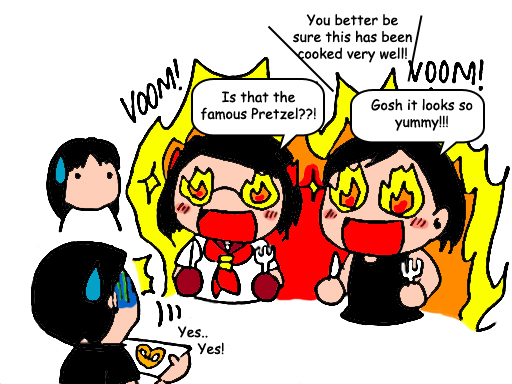 As the result, you got the cooked cheese version of your pretzel! My favourite!! Okay maybe I'm a little bias here since I'm a chocolate lover but I just loveeee to bite those little chocolate bites I even had a few licks although it's finished. That green curry reminds me of Thai! I never knew such a simple set up could be so delicious! I'd give credits to how soft the pretzel is and how aromatic the green curry was. You can have it with cheese. Dip your pretzel with cheese to give an additional taste. DESSERT - Sweetness overdose, anyone? One layer of chocolate cake is not enough for you? How about THREE layers? I was amazed how spongy the layer cakes between. Lava cake with vanilla ice-cream is always a great pair, no matter how bad the taste turns out to be! Anyway, this is a good lava cake. Look at how moist the chocolate is! What makes Pretz N' Beanz stand out in this area are the food and environment. As you all know, heavy dining, pubs or bars are everywhere in Solaris Mont Kiara. If you'd a heavy lunch/dinner and wanting to find a place to enjoy over a coffee for chillaxing, or looking for a place where you can get a quick bite, Pretz N' Beanz is definitely one of the place you can consider.